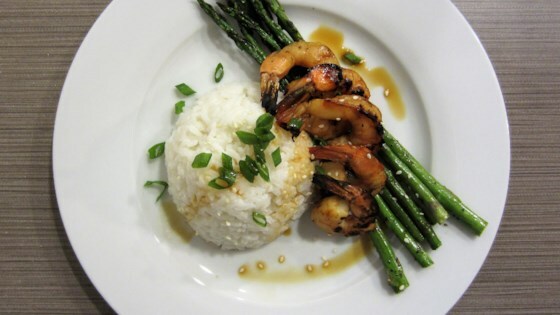 "Teriyaki prawns and asparagus are grilled and served on a bed of coconut jasmine rice for a quick and easy, Asian-inspired barbeque dish." Rinse rice in cold water until water runs clear. Drain and combine with coconut milk, water, and 1 teaspoon salt in a pot and bring to a boil over high heat. Cover; reduce heat to low and simmer until tender, about 12 minutes. Fluff rice with a fork. Mix prawns and 1/2 cup teriyaki sauce together in a bowl until well coated. Toss asparagus with remaining 1/2 teaspoon salt, sesame oil, and black pepper. Lay on 1 side of the grill; cook until tender, about 3 minutes. Flip. Add prawns to the other side of the grill. Grill shrimp until opaque and asparagus is lightly browned, 3 to 4 minutes more. Transfer to a platter. Divide the rice between 4 plates. Top with prawns and asparagus. Sprinkle scallions and sesame seeds on top. Drizzle 2 tablespoons teriyaki sauce on top. Quick prawn, rice and asparagus meal! Nutrition data for this recipe includes the full amount of teriyaki sauce. The actual amount of teriyaki sauce consumed will vary. Amazing! We inhaled it. Definitely recommend. We will be having this again and again and again. The rice was especially good with the saltiness of the prawns in teriyaki. Simple and quick. I used colossal jumbo prawns. I made Jasmin rice to go with them.